The Western Hockey League plans to look into allegations levelled against several of its teams by former players, one of whom told a government hearing this week that he was given excellent school grades in exchange for autographed pucks and was refused an X-ray for days and forced to play in games after breaking his kneecap. 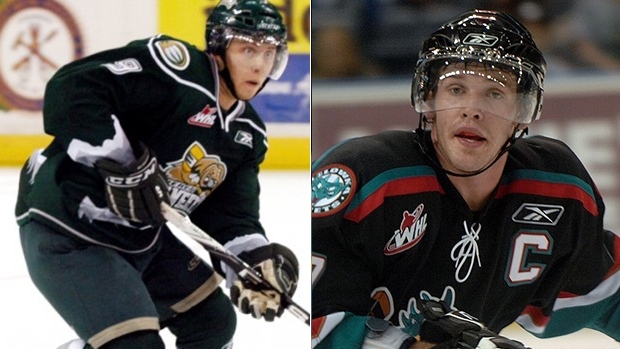 The testimony was given Tuesday by former WHL players Tyler Maxwell and James McEwan in front of Oregon’s Senate Committee on Workforce. The committee was hearing arguments over whether the WHL’s Portland Winterhawks’ players should be considered amateur athletes. If they are amateurs, the team wants to be exempted from paying them the state’s minimum wage (currently $11.25 an hour). The Winterhawks have argued the team will be forced to move or declare bankruptcy without an exemption. Maxwell and McEwan testified against the WHL and Winterhawks, arguing the WHL is a professional league and its teams are for-profit businesses. Maxwell alleged that during his time with the Everett Silvertips, where he played from 2008-09 until 2011-12, he suffered a broken kneecap when he was hit during a game by a slap shot. Maxwell testified that he was refused X-rays after the injury, insulted by a team trainer and then forced to play on the broken bone for seven games. “I was still scoring so they didn’t care what shape I was in,” he said. When he finally left a team practice early and demanded to see a doctor, Maxwell testified that X-rays showed a break. “The doctor couldn’t believe I was skating on it,” he said. Maxwell, who scored 116 regular-season and playoff goals over three-plus seasons with Everett, criticized the WHL’s commitment to player education. Maxwell disputed the WHL’s assertion that it is an amateur league. Maxwell also complained about conditions at the Silvertips’ team rink. “There was no limit on how long they could keep you at the rink and they did not provide food for us, only water, protein powder and Gatorade,” he said. Rajcic did not respond to an email asking whether the club would have a third party examine Maxwell’s allegations to ensure impartiality. The Oregon senate committee also heard testimony Tuesday from former NHL player Paul Gaustad, who played three seasons for the Winterhawks during his junior career, and Robison, who told the hearing that WHL teams “serve as a major source of community pride” and support numerous local charities. During the 90-minute hearing on Tuesday, McEwan, a former Kelowna Rockets captain, also testified against the WHL and the Winterhawks, saying that he has navigated bankruptcy and battled depression without the support of his former teams or the WHL. McEwan, who fought at least 72 times in the WHL, according to hockeyfights.com, played four seasons in the league from 2004-05 to 2007-08, two with the Seattle Thunderbirds and two with the Rockets. He said after suffering multiple concussions in the WHL and undergoing multiple surgeries, he has had to pay his own medical bills for doctors, therapists and counselors. As minimum-wage class action lawsuits against the WHL, Ontario Hockey League and Quebec Major Junior Hockey League work their way through Canadian courts, the leagues and their teams are lobbying governments to exempt teams from paying players minimum wage. Governments including Nova Scotia, B.C., and Washington State have already provided junior leagues with such an exemption. It’s unclear whether the Winterhawks can afford to pay players. According to a copy of the team’s 2015 tax return, filed in a Calgary court in connection with the WHL lawsuit, the team generated revenue of $5.4 million but recorded a loss of $191,995. The team has not provided any financial statements to the Calgary court or detailed its expenses.